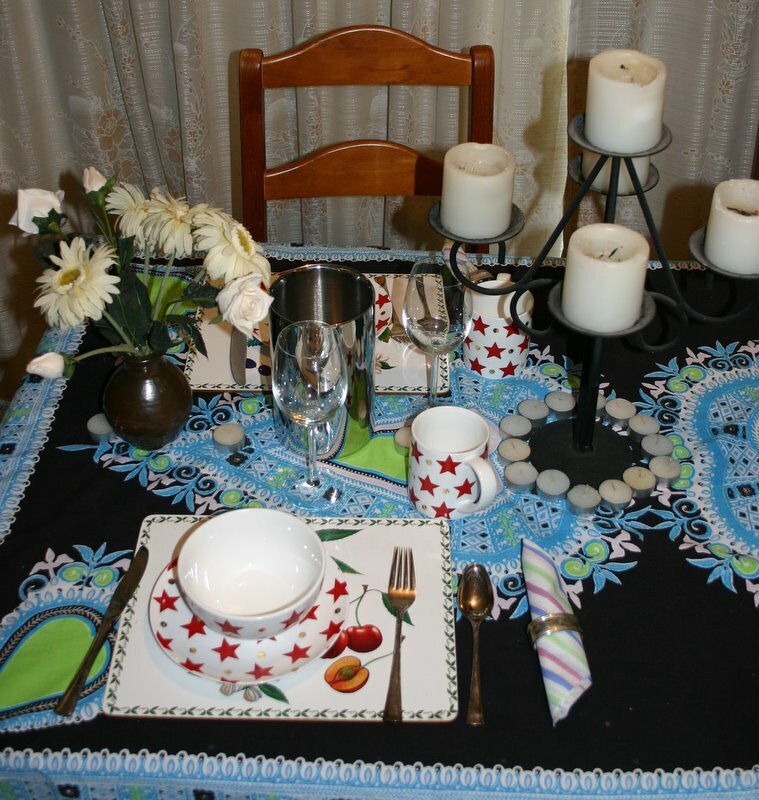 My 8 year old son set the table for our stay-at-home date night last night. He included everything he could to make it as special as possible, even placing a hidden note informing us that a CD had been selected and was in the player ready to go. Once children arrive, going out for date nights is no longer as easy as it once was. If you have ready access to babysitting you may be able to go out regularly, but many of us find that it becomes more and more important to spend some time and effort planning special evenings at home, to be enjoyed after the children are in bed. Good date nights take planning and effort. Decide ahead of time what you will do. If left to the night itself, most of us find that we simply lack the energy and inclination to peel ourselves off the couch to get to bed, never mind make a date night special. Pick a night each week or fortnight that will be your non-negotiable date night and don’t change it unless something extra special comes up instead. Perhaps arrange babysitters for one or two nights a month and plan to have date nights at home for the other nights. If you are lucky enough to have two sets of Grandparents, you can alternate between them which means you only require them to babysit for you once a month – not too much of a load on those already often committed parents of ours. If you find it difficult to find babysitters, perhaps you could get together with another trusted family and swap babysitting with them – you go out one week while they watch your children and they go out the following week while you watch theirs. Keep in mind your spouse’s love language. These date ideas will cover acts of service, quality time and easily lend themselves to physical touch, but don’t forget gift giving and words of affirmation. You could write a special invitation and leave it in the letterbox or email it to hubby at work, telling him how much you love him, how wonderful he is and building anticipation for the evening to come. A love note can be included on the dinner table or in the picnic hamper or written on the bathroom mirror in the morning before the date night and of course, you can spend the date itself speaking affirming words that you know will be meaningful to your husband. Simple, inexpensive gifts can also be easily incorporated into the evenings. Why not wrap up the massage oil for the bathroom evening for example and hide it in his briefcase before he goes to work? You could tuck a wrapped new pair of socks into his undy drawer for a sock wrestle later and instruct him to wear them to the date or the brand new CD he has been wanting could be playing on the stereo as a surprise with the case wrapped up for him to open as the date begins. Simple items that will be a part of the date night anyway – even his favourite chocolate – can be given prior to the actual date to have him looking forward to it excitedly or as a part of the date experience itself. As you can see, all of these ideas are relatively inexpensive and easy to do but do require pre-planning. All communicate love! Don’t forget that you are romancing your husband so take the time to look nice and present yourself in the way you know he likes. If he has a favourite outfit, why not wear it? No one else is around to see you so please his tastes, rather than your own, when you choose what you will wear. Take a shower and get dressed up – the same as you would when going out. Put on some makeup, the perfume your spouse loves and more importantly for him – the undergarments he loves! Anything he has chosen for you will usually be appropriate here. You don’t have to go out so you don’t have to wear them for too long and if you let him know you have it on at the start of the night, he’ll be fairly keen to take it off you by the end of the night! Do you have a trampoline? Take out the doonas, sleeping bags and pillows for some cuddling and star watching. Sock wrestling on the tramp is fun too – each of you wears socks and tries to pull the socks off the other first. Lots of giggling and close body contact here. Set up a restaurant dinner at home with candles, tablecloth, wine – the lot. If you have one, hang a mozzie net around a small table and chairs on the back patio for an intimate setting. Alternatively, a table for two in your bedroom may work well. Perhaps the older children could even wait on the table for some extra pocket-money, just like a real 5 star restaurant. Try a picnic on the grass in the backyard – don’t forget the portable stereo for some mood music. In wet weather, a picnic on the lounge room or bedroom floor can be nice. What about a board game championship play-off with all the old board games you used to play and enjoy growing up. Maybe the winner gets to choose something the looser can do to (or for) them. Maybe this is your chance to try strip poker? Set up a tent in the backyard with the kids during the day and have some fun playing in it with them first. In the evening before hubby gets home, turn it into an “adults only” area. Fill it with a mattress, doona, pillows and the like. Maybe set up the coffee table and lots of cushions around it for Middle Eastern style reclined dining. How about roasting marshmallows over the camp stove? You could even sleep out over night. Clean the bathroom from top to bottom during the day. (There’s nothing romantic about sitting in a mouldy, sandy, finger-marked bathtub – or is that only my bathroom?) Deck the bathroom out with ALL your candles, sprinkle rose petals, put on some mood music and fill up the bathtub. Set out the best towels for afterwards. Perhaps have some massage oil or a back massager on hand. Wash each other all over and go from there. If it’s the kid’s bathroom that has the tub, make sure you remove all those toys and other paraphernalia – you want the setting to be romantic. Movie nights are great occasionally but don’t let this be the default option on a regular basis. Hire an old favourite or a DVD that you with both enjoy. Set up the lounge for the full cinema experience – low lighting, blankets, make popcorn and snacks and put them in paper cones or cups. If babysitting allows, how about having the children looked after in the morning instead (or even better, overnight at the Grandparents for bonus date night AND morning). One of the things we miss most is a sleep in, leisurely breakfast, coffee and reading the newspaper in the mornings. We like to go out to breakfast and coffee at a café too if we get the chance, maybe stroll around the shops, markets or wherever we are, before collecting the children at lunchtime. Hold a karaoke night for just the two of you. Not my thing, but some love to sing along and since there’s no one watching, why not give it a go. Dust off that icecream maker, waffle maker, or simply set out a bunch of toppings and icecream flavours to create your own tasty treats – perhaps make a huge icecream Sunday to share. Climb up on the roof with a blanket and do some stargazing and have a heartfelt conversation. All right, not all roofs are suitable and we don’t want any broken necks, but you’d be surprised how easy it is to find a comfy position on some. Don’t put your foot through the tiles though; climb up the ridge capping rather than across the centre of the tiles.